Oregon Ballet Theatre: Celebrities in Washington, D.C.? OBT's very own Brian Simcoe with Senator Gordon Smith! 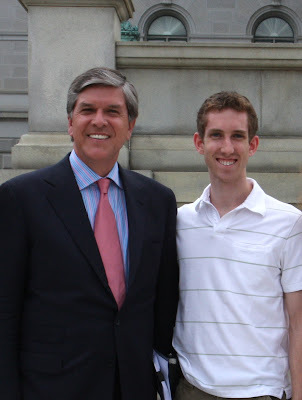 During OBT's Kennedy Center debut, the Simcoe family ran into the Senator just outside the Supreme Court building. While the Simcoe's were excited to see this Oregon "celebrity," it turns out the Senator was just as impressed with OBT and the glowing reviews and accolades we'd brought to the state of Oregon! This is an awesome dance company, anyone who enjoys the arts will find a performance they will enjoy. How cool this young man got to be in Washington D.C. and run into this Senator.